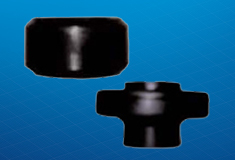 Oil States manufactures bar-type tubing test cups, water savers and drag-type cups used for hydrostatic testing of tubing. Our bar-type test cups are available for various tubing sizes and weight ranges, as well as tool sizes. Nitrile compound in 70, 80 or 90 durometer is the standard version, with a 90 durometer natural rubber compound available on request. Numerous tubing sizes and weight ranges available. Wide range of durometers allows for testing in various conditions.